Founded in 2011, the Academy of Emergency Ultrasound (AEUS) is an international forum bringing together clinician sonologists with the common goal of advancing patient care and safety through the use of bedside ultrasound. 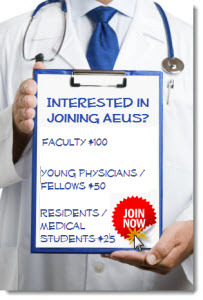 AEUS task forces promote the development of training curricula for medical students, residents, and fellows, as well as of tools and resources for further research and development. Join the largest academic community dedicated to education and research in emergency ultrasound. Discuss EUS topics in a large network of your peers. Access a large library of AEUS member-created educational documents and narrated lectures. Take advantage of the AEUS peer review service and get feedback on your EUS research ideas before you collect data. And much more! Join Today!